Three years ago, "Kimmy Dora: Kambal sa Kiyeme" was released to universally-acclaimed reviews. Even we found it hilariously refreshing, daring and over-the-top. It's surprising to find out that the sequel, "Kimmy Dora and the Temple of Kiyeme", is completely devoid of the things that made the first film fun. Minus the comedic chops of Eugene Domingo, there's really no other positive thing that can be derived from this film. It's truly sad to see how badly this sequel was executed and how far off it strays off from the first one's vision and impact to the local film industry. They should have left "Kimmy Dora" untouched and the end product just proves this point to an absolute. Kimmy (Eugene Domingo) and Dora (Eugene Domingo) are identical twins with totally split personalities. Kimmy is the smart, dictatorial type while Dora is the slow, dumb-wit sister. When Kimmy, Dora and their father (Ariel Ureta) takes a trip to Korea, they discover that their family has great ties with the Sang family. The Sang helped their family attain great riches as such, the Go Dong Hae's have a debt of gratitude to the Sangs. The Sangs are now requesting that one of the sisters must marry Daniel-san. When Kimmy and Dora both refuse the arranged marriage, a ghostly presence suddenly haunts them with Kimmy hearing the ghost and Dora seeing it. When the ghost gets the soul of their boyfriends and father, the two must find a way to get their loved ones back to normal while finding out what the ghost's agenda is. We are pretty sure that "Kimmy Dora and the Temple of Kiyeme" wasn't made with bad intentions in mind. But the bigger budget might have affected how the overall thought-process was accomplished. Honestly-speaking, it seems as though they wanted to do many things at the same time and yet, those never gelled together to bring a compelling watch. Instead, it sucked all the fun out of the sequel. The plot was so-so at best and the way it was developed was mind-numbing. You get a feeling that they just wanted this to be a longer film which completely makes no sense as it was ineffective and actually made the film dragging its whole second half. How we wished that the writers made this a straight forward experience instead of all the flip-flopping to make the story worse than it should have been. As for the comedy, Eugene Domingo is Eugene Domingo. She struts her acting chops brilliantly but something's off. Maybe the same jokes are getting stale but we did feel that there's some originality lost here. 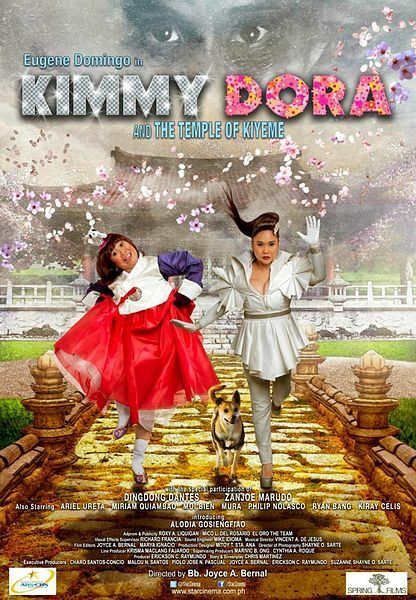 "Kimmy Dora and the Temple of Kiyeme" is deeply disappointing considering how its brethren performed. It joins an endless list of originals being better than its sequels but for us, this was worst than that - it clearly shows why a sequel should have been avoided from the get-go.